Columbus was located on a B&O secondary line that connected Cincinnati and Pittsburgh via Wheeling, WV. 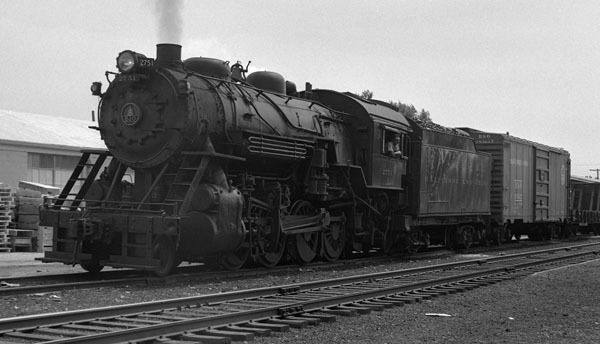 During WW II there were two passenger trains each way which dropped to one each way by the 1950s. Freight and passenger locomotives were not serviced in Columbus, that took place at Newark which had a larger B&O locomotive servicing facilities. 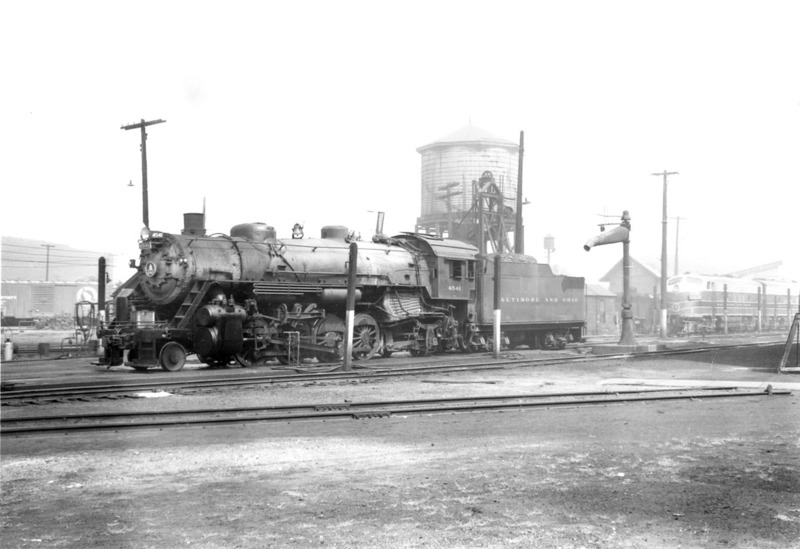 A two stall engine house in Columbus only serviced the West Broad Street to Summit helper and the Columbus – Midland City local locomotives. The Newark to Columbus local worked out of Newark. That local switched the B&O freight house in Columbus, the Columbus Army Depot in Whitehall and other businesses along the line. Following are descriptions of steam locomotives that worked through Columbus post World War II. E-27ca – 2-8-0 - Primarily used for local and switching duties in Columbus. When built the E class were main line freight locomotives. 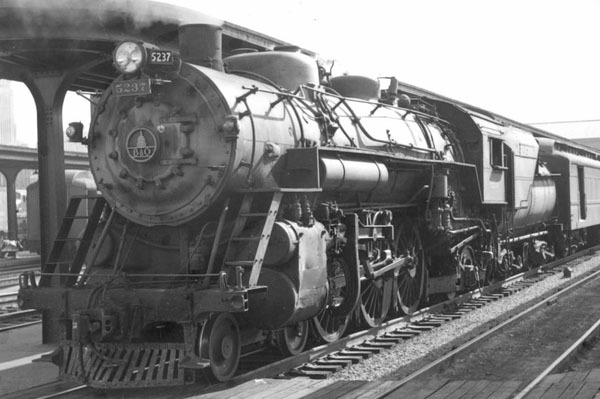 The first E-27 class locomotive was built in 1905 with many added over the years. There were 414 class E-27 locomotives and as they were modified their sub letter identified the modifications that were made to them. 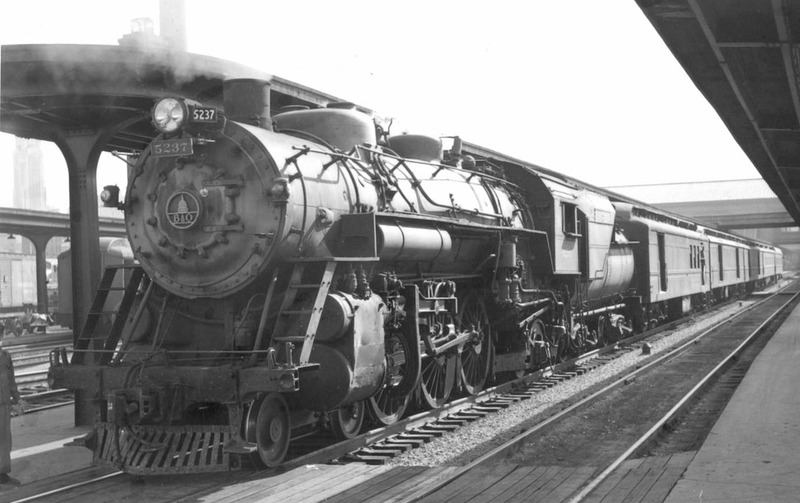 Starting in 1923, 165 E-27a and E-27b locomotives were modified becoming E-27ca. E-27ca No. 2751 with the Columbus - Midland City local at Grove City, Ohio. Photo by Donald A. Kaiser, August 1956. 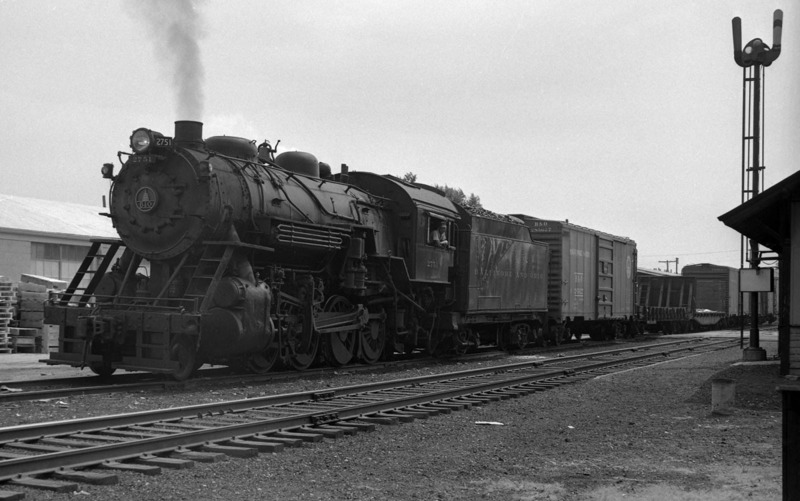 Q-3, Q-4, Q-4b – 2-8-2 - Used in Columbus for freight and helper locomotives. Eastbound freights had a helper attached at West Broad Street to assist in the climb to Summit, 14 miles east of Columbus Union Station. The first two B&O Mikados were conversions from Consolidations. In 1911 150 Q class locomotives were built by the Baldwin Locomotive works. 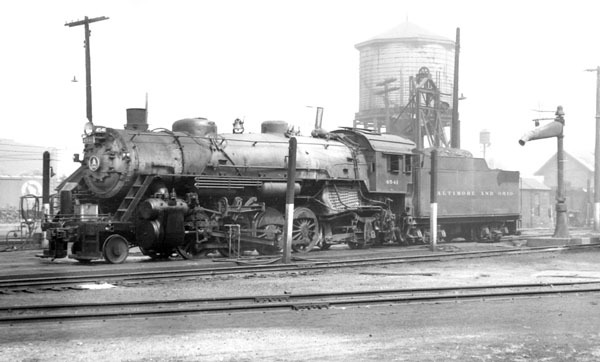 In 1918 the B&O received 100 USRA light Mikados that were desiginated Q-3. Between 1920 and 1923, 135 heavy Mikados designated Q-4, Q-4a and Q-4b were built. 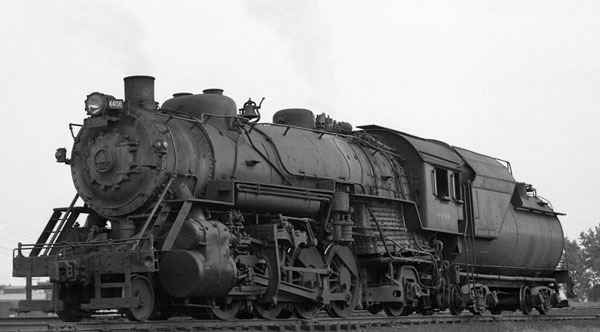 The Q-4 class were equipped with steam heat and air signals for passenger train service and were used on troop trains. Q3 No. 4541 posing in Chillicothe. No. 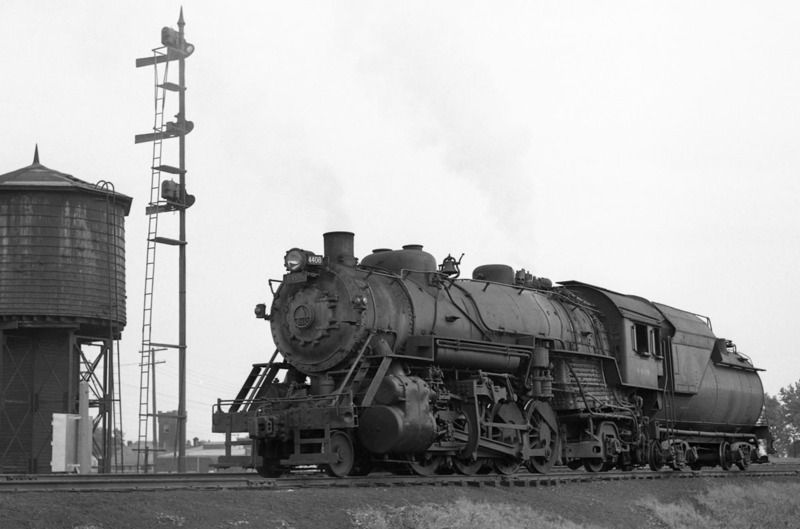 4500 was the very first of 625 USRA light Mikados built for multiple railroads during WW I. It was completed in just 20 days. 4500 is preserved at the Baltimore & Ohio Museum, Baltimore. Photo by Donald A. Kaiser, September 1954. P-6a, P-7 – 4-6-2 – Passenger locomotives. The B&O line through Columbus (Midland City, Ohio to Wheeling WV) was a secondary line. When the P-7 class Pacific locomotives replaced the P-6a on the main line the P-6a Pacifics were moved to the secondary routes like the line through Columbus. Later when the P-7 was replaced by diesels on the mainline, Columbus would see the P-7 on the two passenger trains through Columbus. 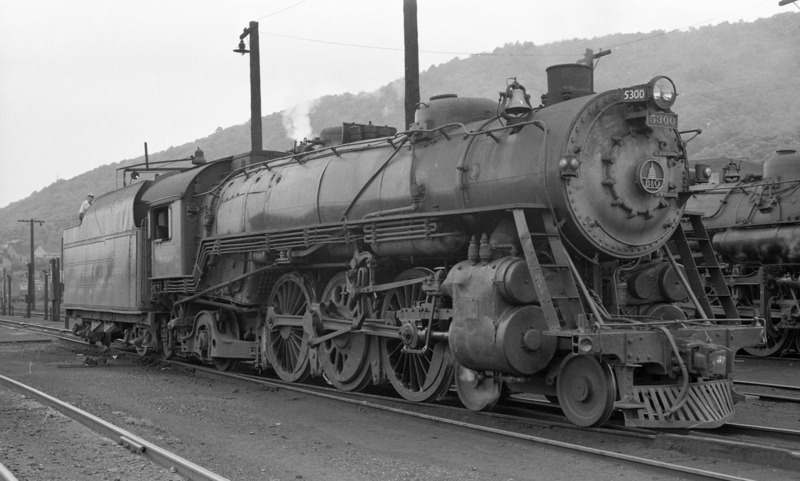 The P-7 locomotives were each named for a U.S. president with No. 5300 being President Washington and 5320 being President Cleveland. Since only the last names were used there was only one President Adams. By the time the locomotives started showing up on the Columbus line the names had been removed. The four and five car Columbus trains did not tax the President Class locomotives. As the P-7 locomotives were modified over the years sub letters b-e were added and one, No. 5310, was changed to P-9b. A P-6a at Columbus Union Station with eastbound train No. 238. Photo by Donald A. Kaiser, August 1952. P-7 "President Washington" being serviced in the 1950s. Photo by Donald A. Kaiser.